I ask your forgiveness for the rather drab, grey scene in the picture below. Seeing as it’s Brent Cross car park on a wintry February morning, though, it’s perhaps not surprising I couldn’t make it look any more appealing. So why is it here? When I was there yesterday I become unduly fascinated by the set-up you see happening, and how it seemed to be a great example of nudging. You can see the silver car on the right coming towards the camera. 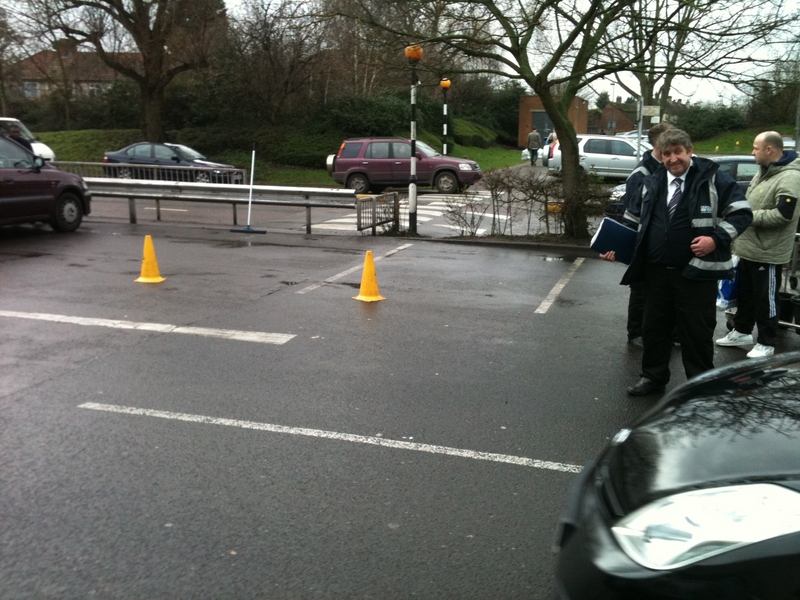 The driver has just entered the car park, and on their right (your left) is a run of spaces blocked off by a series of yellow cones. 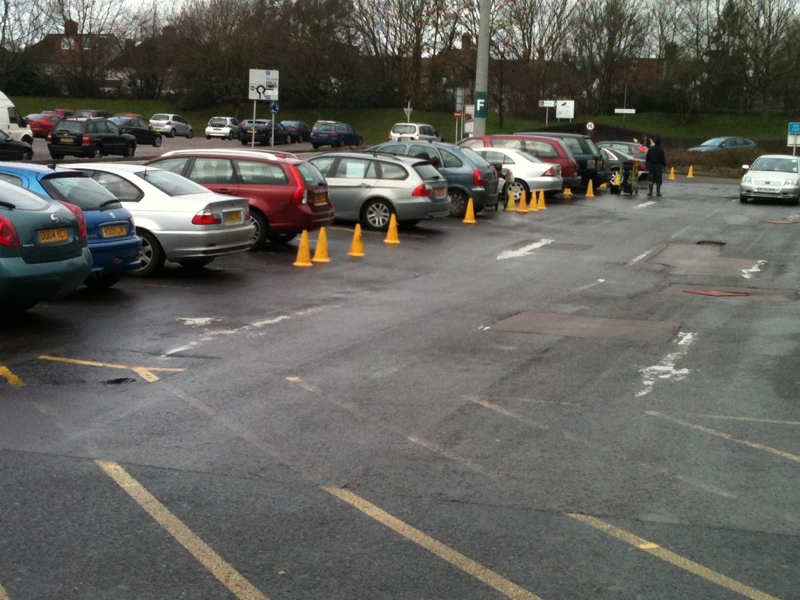 As you proceed down this stretch, perhaps intrigued by the disruption, but nevertheless keen to secure a parking space not too far from the actual shops you came for, it becomes apparent that the spaces with yellow cones are earmarked for drivers who are paying to have their cars washed during their stay. So, upon arrival, you’re presented with an interesting choice, and your decision may depend greatly on the perspective you bring to it. Then there’s the car wash factor. Maybe you run away from the sell – like a squeegy merchant, but with parked, more defenceless cars. Or maybe, this is a brilliant use of your time, so you jump at the chance for you vehicle to have the once over. This is all going through your mind, of course, while you’re driving, and your response to it probably instinctive. In a split second, you might decide that on balance, the certainty of parking space, when combined with the promise of a nice clean car when you return, is a worthy investment. It is, in fact, a deceptively simple bundle, with the decision based on a complex mix of time, money, convenience, service, design and instinctive behaviour. The point is, that on their own, each of these interventions (the paid-for space, the car wash) is too easy to resist. But when put together they’re way more powerful, and somehow represent some genuine, contextually relevant added value. It works because they each reinforce the usefulness of the other. It works particularly well, I think, because the showiness (or profligacy) of saying ‘yes’ to either one is offset by the functional motivation behind the other. At a moment when, by definition, you’re about to go spend a lot of money (or else why are you there? ), the bundle provides a pleasing echo of justification that makes it a little easier for our brains to accede to during automatic mode. Not sure if I can imagine it working in many other places. But it makes sense in the context of the perculiarly functional leisure pursuit that is shopping at a mall, being as it is the spirtual home of post-rationalised self-reward. …told me so. I think he thought it odd that I was taking pictures. But by then it had reminded me of a similar idea I heard suggested by Rory Sutherland at a recent IPA workshop that I’d been invited to. It was with the Cabinet Office and a bunch of agency folk, generating ideas to feed into the recent Green Paper on Giving – to charity, or volunteering. I’ll leave aside my thoughts on the Big Society thing – the aim of getting people to do ‘good things’ was interesting whatever your political persuasion. It was a fascinating discussion, some of which focused on the curiously British reticence to publicly talk about what money we give to charity. Rory talked about the lack these days of mandatory conspicuous shows of wealth – like, for example, car stickers with ‘GB’ on them, attached to cars that had been driven abroad, distributed by definition only by people rich enough to drive their cars overseas. The question was, how to build new mechanisms that capitalised on this sort of obligation – or rather, that reflected in more munificent ways the kind of money people have to spend. One such idea was was around matching the premium attached to parking spaces with a more traditionally fiscal premium that would get people to give more conspicuously to charity. Say most spaces were £5 an hour. Setting the cost of a handful at something like £25 an hour would limit their market, but the few who were able to pay would have their money go to a good cause. So, there’s always a likelihood of a space being available, and if you’re forced to pay at least your excess fee is going to a good cause, and not whoever runs the parking. It’s not a perfect idea, and many would argue against it being workable. I don’t think it’s quite so elegant as the Brent Cross set-up. Yes, the two interventions wrap up neatly – but participation would feel more forced than opt-in. And, of course, the beneficiary is someone other than yourself. Still, in the context of the alternative, it might go down well. And as the Brent Cross experience shows, these kind of matched premiums exist already, and can function pretty well. Perhaps the critical factor is not to attempt to persuade people to give, but to enable them to do so. The key, as ever, is to go with the grain of existing behaviour, not against it. « Red hot, red herring… or just read nothing else?